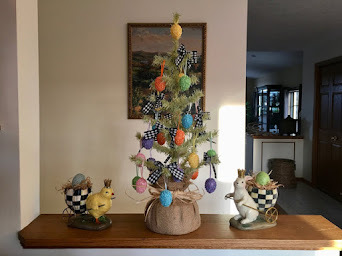 Home and Gardening With Liz: Holiday Fun and Slowing Down! A while back I planted three amaryllis bulbs called Barbados. As Christmas drew near they were nearly open but I had to leave to go be with family so I crossed my fingers that they'd be open when I returned! 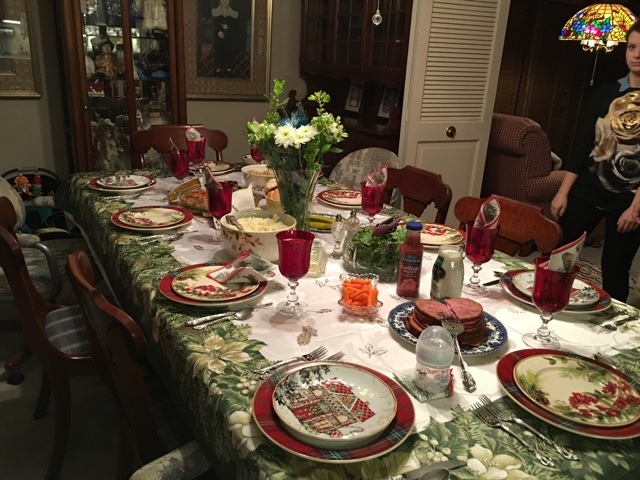 We went to my sister's on Christmas Eve and had a great dinner with plenty of food to choose from! 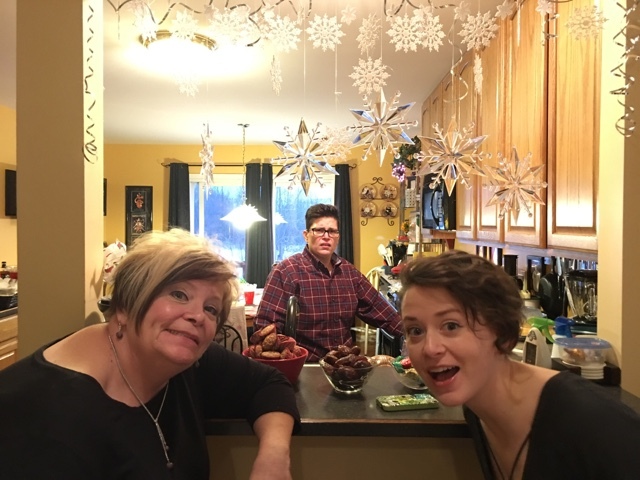 Our daughter Chelsea on the right and Jen's daughter in the rear being silly. Jen lives in a townhouse and the entry has a tall set of stairs with these graduated open stair shelves. 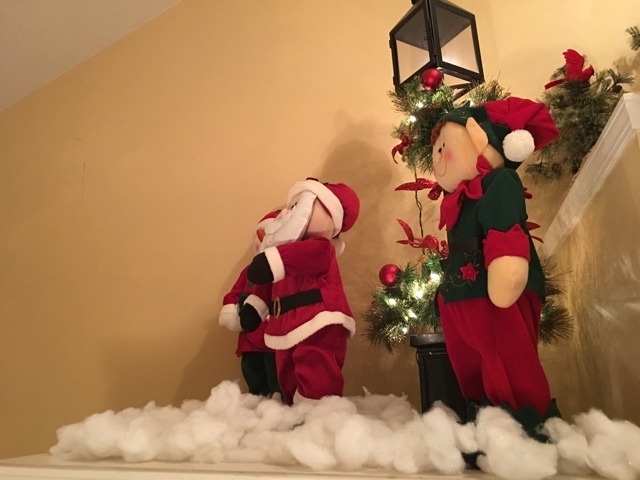 This year she decided to do a different theme on each shelf. 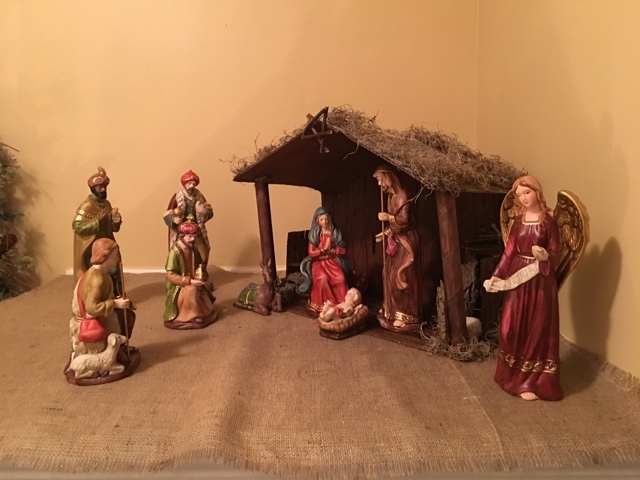 She made this manger out of cardboard. Used markers to stain it and create a wood looking finish. They found the nativity pieces at Kirklands. Santa and his elves! It was cute to walk up the steps and check out each level! 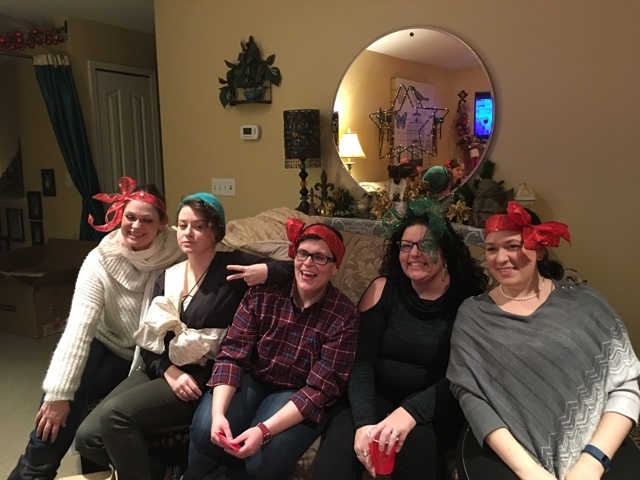 After opening gifts the younger cousins and sister in-laws posed with ribbons from their packages. These kind of pictures will be fun to look back at when they're older! 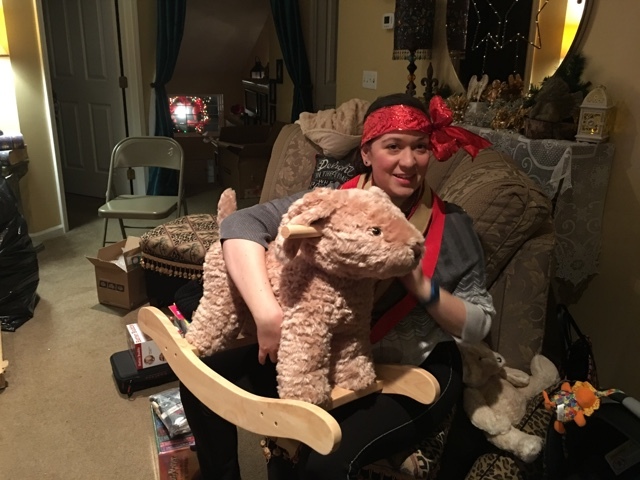 Our gift to our Grandson was this Labradoodle rocking toy. It'll be a while before he can use it but it will be cute for the nursery in the meantime! 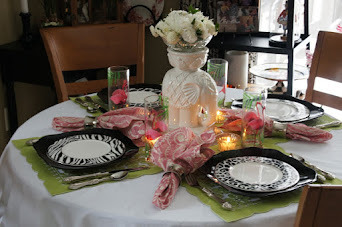 Christmas Day I prepped my mother's dining table with linens and dishes I brought. New carpet had been laid just days before and the house was tore apart too much so there was no Christmas decorating this year. I figured I'd bring in my own festive look! Our daughter in-law is Italian. Her mother figured out how to do a three way conversation with Facebook chat and she was on the phone with her family in Pennsylvania and Italy when I took this picture. Our grandson is 3 mos. old now and very alert! I prepared the food throughout the day and we ate around 6 o'clock. I snapped a quick shot before we were seated. Later on he was was tuckered out and sleeping in his his dad's arms. Monday morning we met the kids at a local restaurant for breakfast and visited a good while before we had to say our goodbyes. We live a good distance apart so we try to get in as many moments as possible! 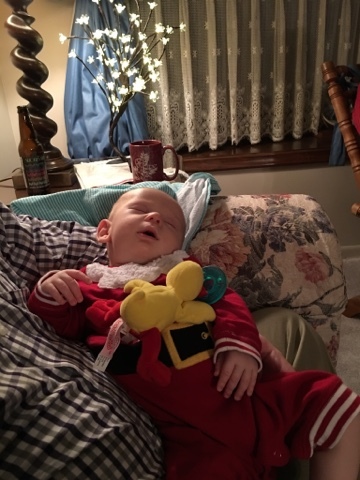 Our grandson had just been fed and he eventually conked out! He's such a sweet baby! We got home Monday evening and I was so happy to see the amaryllis flowers opened up! I was snapping pictures as soon as we were in. I feel lucky that it timed out so nicely. It doesn't always go this way when you plant them! I have to say this is the prettiest one I've ever grown! I have three more stems coming up so I'll be enjoying these for a while! I'm glad to be back home and will continue to enjoy the holiday decorations until the New Year! It feels good to slow down and just enjoy everything. Oh what fun pictures. Looks like a perfect Christmas. A beautiful Christmas celebration with family. The table looks so pretty. Your Grandson is growing and is a cutie. Wht a lovely gift for him. 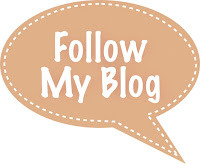 Enjoy your decorations, relaxingin your lovely home. I love your blooms. It is so warm here. Merry. 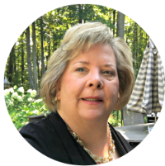 Merry, Liz. It looks like you had a wonderful Christmas celebration. Now you can relax and enjoy your blooms. 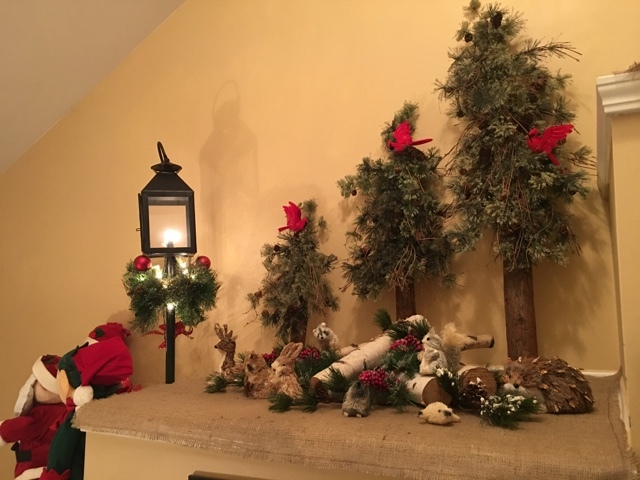 It looks like you had a fun time at your sister's house; her home looks so pretty decorated for Christmas. 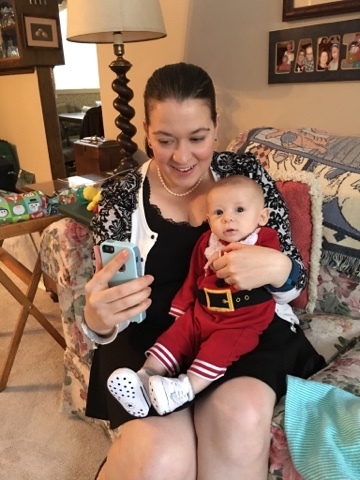 Your grandson is absolutely adorable in his little Santa suit, and what a sweetie he must be. :) Little boys really are sweet -- ours sure was. 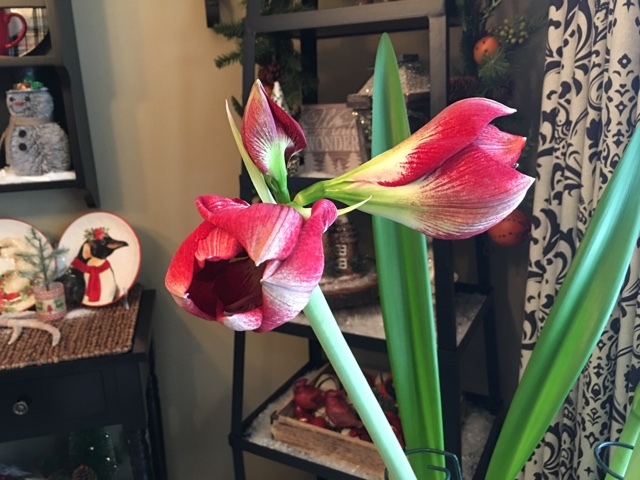 Your amaryllis flowers are gorgeous -- what a pretty color! I'll have to try some of those next year. 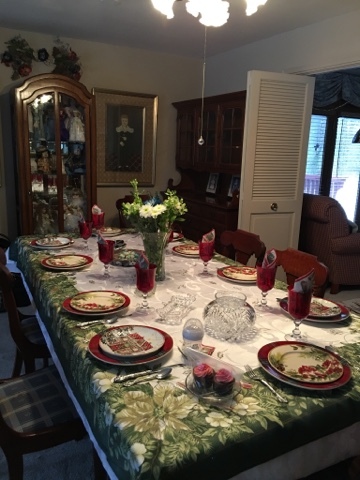 Thanks for your kind comments earlier on my Christmas tablescape. I'm sorry it's taken me so long to get back to you; that seems to be the story of my life these days. ;) Have a great weekend and wishing you all the best in the New Year! 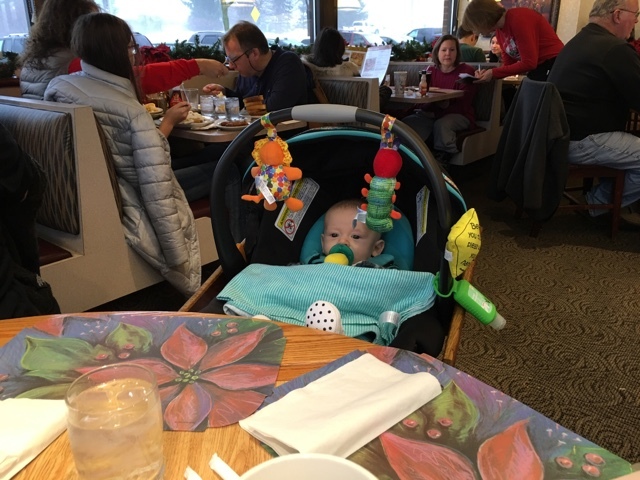 Beautiful table and beautiful grandbaby. And how fun to haul your dishes. That is great. Happy New Year! 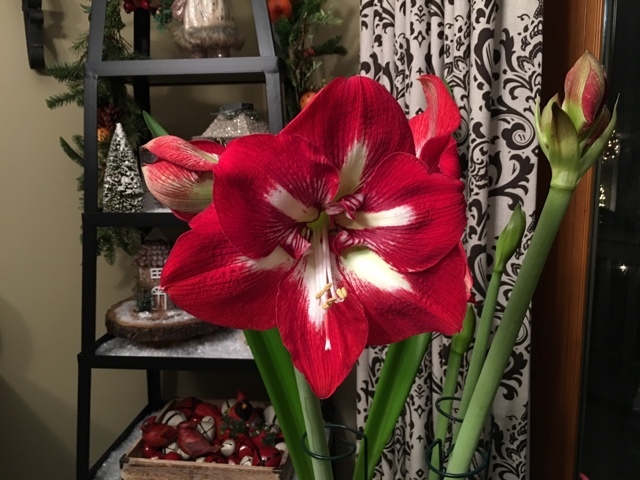 What a beautiful amaryllis! Your timing was perfect to enjoy its bloom. 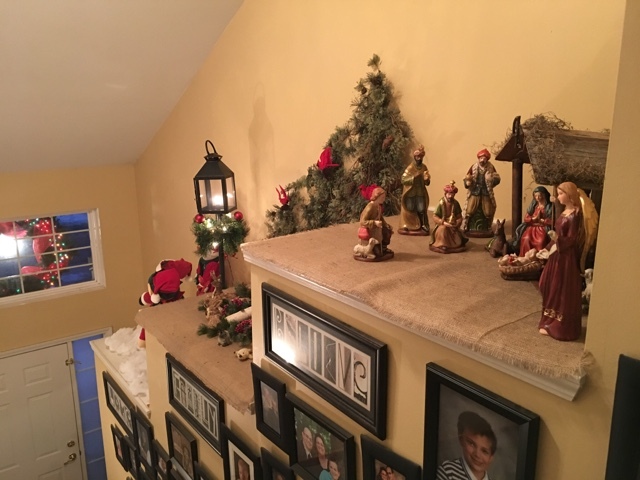 I get such a kick out of seeing how different people decorate for the holidays. Your sister's use of the stair nooks was very clever. 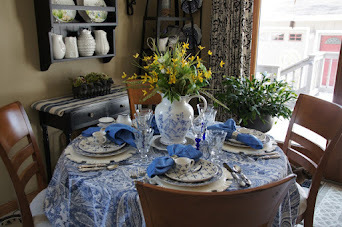 The table looked beautiful. Wow! That was a lot of hauling if you brought all those dishes. 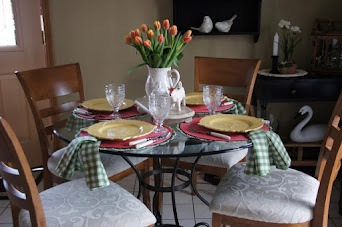 Did you use different salad plates at each table? I'm glad you got to spend Christmas with your family, especially your sweet grandson! Liz, what a wonderful Christmas celebration...your grandson is adorable! 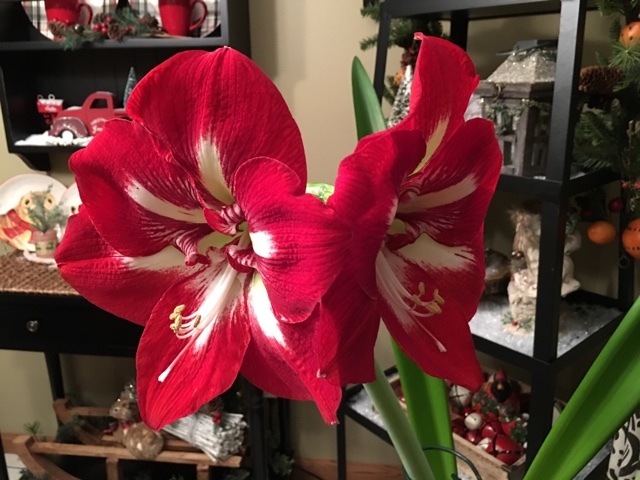 Your amaryllis is amazing! Happy Mew Year! 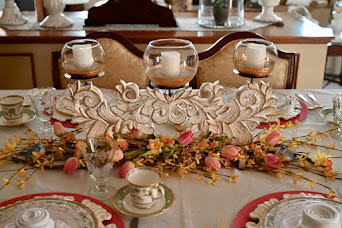 Beautiful family portraits, Liz and a wonderfully festive table!